Okay, let’s get this out of the way right now. I do not like running. I especially do not like running long distances. I might, every now and then, break into a run to get my heart rate up if I’m out fitness walking, but one minute of running and I’m done. However, liking to run is not a prerequisite for liking to read about running, particularly when the book is not so much about running as it is about committing to something you enjoy and doing it to the fullest. That’s what Haruki Murakami is talking about when he talks about running in this short memoir. Murakami took up long-distance running largely to stay fit after beginning a full-time career as a novelist. Previously, he had owned and run and jazz club, and there was enough physical activity involved in that job to keep him from gaining weight, but writing was a different matter. He chose to run because it was something he could do anywhere and because it suits his personality. Murakami is very clear that running—especially long-distance running—isn’t for everyone, not because it’s extra difficult but because body types and temperaments differ, and some people are better suited to other forms of exercise. Murakami doesn’t like competitive sports, and he considers himself terrible at sprinting, but long-distance running works for him. 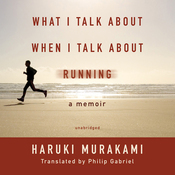 In this audiobook, read by Ray Porter, Murakami talks about why and how running works for him. He discusses his training and his experiences in numerous marathons and triathlons. The book did nothing whatsoever to convince me to take up running, but that’s not the point of the book. Murakami says so early on. What the book does offer to the nonrunner are thoughts about taking pleasure in our pleasures, pushing through difficulties, learning the small steps that can help us improve, and accepting our limitations and our selves. Murakami couches all of this in thoughts about his own life, never in didactic instructions to the reader. One of the things I enjoyed about the audiobook is how Murakami is clear about who he is and accepts who he is. He doesn’t see himself as a perfect person; in fact, he says he’s surprised that anyone would like him. But he also doesn’t seem interested in becoming someone else. Instead, he’s focused on making the most of his strengths and personality in all his endeavors. I liked that about him. It’s true that he does sometimes come across as too intense a person for me to want to hang out with, but I appreciate people who know who they are and aren’t apologetic about it. Overall, though, this book didn’t set my world on fire. I liked it well enough. It more than exceeded my rather low audiobook standard of being better than drive-time radio. It held my interest, even if it was repetitive at times, and it left me with a few things to think about. I imagine a runner or a serious Murakami fan would get more out of it than I did, but I got enough pleasures out of it to say that it might also be worthwhile for someone who’s not a particular enthusiast for running or for Murakami. This entry was posted in Audiobooks, Memoir, Nonfiction. Bookmark the permalink. This sounds really interesting to me and I think I may even have a copy of it in a pile somewhere. I don’t like running either but I like reading about other people’s passions and why they do them especially when they are thoughtful about them like Murakami seems to be. Well now I am going to have see if I have the book and if not, be sure to get myself a copy! Stefanie, Yes, this is as much about passion (and the discipline that comes with it) as it is about running itself. Hope you enjoy it! Steph, Oh, I don’t know if this would inspire a nonrunner to run. He’s very clear that it’s not the exercise for everyone, and he doesn’t exactly make it sound like fun. I didn’t realize this was a memoir. I haven’t been successful yet with Murakami, but this sounds quite interesting. I had exercise of every kind. But I’m trying to like it, since I really need to do it more often. I hear you, Rebecca. I don’t like to exercise much either. I’ve had to combine exercise with something else I enjoy (listening to podcasts, watching TV). And even then I mostly like how exercise makes me feel afterward. Interesting book – I hadn’t heard of this one before. I used to run marathons but fell off the running wagon – I would love to get back to it! That first run is the hardest . . . .
Colleen, I’m always impressed to hear people have run marathons! So good for you! Murakami has run one a year for years, and he does talk about how he’s gotten back into it after some bad runs. I did find a few of his reflections on writing. But most were inextricably linked to his running. I did like knowing what Murakami was before he was the Haruki Murakami. Sasha, true, all of his reflections were in one way or another linked to running, which didn’t bother me because I found the links interesting. But I still do not understand the appeal of running. I keep meaning to start running and because I always look for excuses to get books, I thought listening to this while making my attempt might be entertaining. I bet it would, Iris, but I don’t know if it would be motivating or dispiriting. Maybe a bit of both!